Asrat and her two youngest children. Her daughter is now a sponsored child through CFTC partner, ISAPSO. We’ve been keeping you up to date on how small-scale agricultural production and the income it offers is a key to hunger alleviation, especially among impoverished women and children. Asrat Tola’s story is a shining example of how well it works. Burdened by years of low income and a poor standard of living in Ethiopia, Asrat and her family faced a future as unpromising as their past. But driven by an entrepreneurial spirit and a strong business sense, Asrat – with the help of a local program for vulnerable urban women and child sponsorship – is now a role model to her community. Biniyam Solomon of ISAPSO (on left) has worked closely with Asrat and her self-help group. “I wanted my child to go to school, but I couldn’t afford that. I cried and felt hopeless. I now understand my potential and work hard to earn a living and support my family. 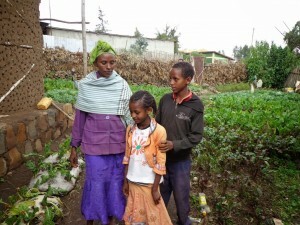 I face all struggles and challenges in life with confidence,” said Asrat, a mother and entrepreneur supported by Canadian Feed The Children’s local partner in Ethiopia, Integrated Service for AIDS Prevention and Support Organization (ISAPSO). 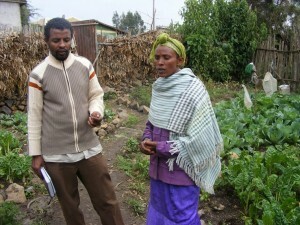 Asrat lives in Chancho, near the capital of Addis Ababa in an area not often supported by government agencies but where poverty – especially among women and children – is high. Through ISAPSO, Asrat has been able to participate in a local Self-Help Group: a microfinance initiative that teaches women basic business skill training, financial management and leadership, as well as creating a credit system to open up livelihood opportunities. With this training, and the support and encouragement of other members of the group, Asrat has improved her family’s standard of living many times over, and now acts as a role model for her three children, and other community members in her situation. Heather Johnston (centre, with notebook) checks out Asrat’s chickens. “Asrat is a great example of ‘the multiplier effect.’ When we visited, her urban garden covered every square inch of her backyard. 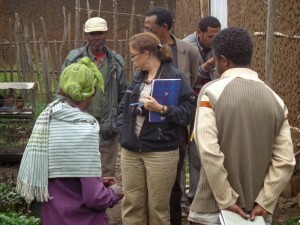 In her first year, she raised enough money selling her produce to buy chickens, then sold chickens to buy sheep, and has now sold them to grow a thriving vegetable and livestock business and support her family,” said Heather Johnston, Director of Programs at CFTC. Things were not always as abundant. Asrat dropped out of school at Grade 7 after her mother died. Before and after her marriage, she was exposed to many social and economic challenges, and was never able to move beyond a subsistence income. Even after marriage, Asrat was the primary breadwinner in the family as her husband suffers from a chronic neurological condition that prevents him from earning any substantial income. Before enrolling in the CFTC-ISAPSO program, Asrat sold charcoal. Already demonstrating some business skills and a strong entrepreneurial spirit, the training and support she received enabled her to diversify her business many times. Starting by producing and selling local alcoholic drinks, she then began cultivating vegetables and baking bread for sale at market, and expanded her wares to household goods, furniture, and more. With what she grows and earns, her family now enjoys vegetables three to four times a week, an impossible thought a few years ago. 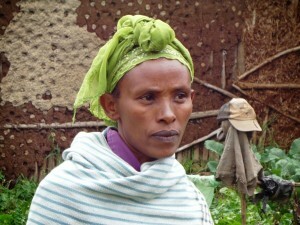 Since 2008, she has borrowed and paid back a total of 4,400 Ethiopian birr (about $240), which has enabled her to support herself and send her children to school. Asrat is now secretary for her self-help group, participates in the “cluster-level association” – the umbrella organization that supports and governs the self-help groups operating in her area – and gives motivational speeches to others in her situation in her community. With her youngest now supported through ISAPSO’s sponsor a child program, and steady income providing for her own and her children’s needs, Asrat has found time to plan for her next business venture: she hopes to borrow money again to set up a retail business selling coffee, sugar, salt, incense, and other spices on market days in Chancho and surrounding villages and towns. There is no reason to believe she will stop setting new goals for herself any time soon.